Main Features: This set of maps depict the Tahoe to Yosemite trail from Telephone Gulch in Summit City Creek all the way South to the trail junction for Bee Gulch on Mount Reba above the East side of Lake Alpine. The black trail dots with red centers represent the unmaintained or unmarked trails through this section of the Tahoe to Yosemite Trail. From Telephone Gulch to the open rock area before the first ford of Summit City Creek the going is pretty rough. There are very dense forests of Sword Ferns that have large networks of exposed, elevated roots. The roots want to trip you, so the Swords can impale you. There are wide sections of downed forest (beetles and/or blight) and washouts. These areas are hard to travel across due to the occassional necessity to climb over downed trees and push through dense overgrowth, while looking for sign of the trail. After all that you come to an exposed section of fine granite before reaching the first ford of Summit City Creek. Backpacking permitting authority: The El Dorado National Forest on the North Side of the Mokelumne Wilderness on Tahoe to Yosemite Trail at the Carson Pass on Highway 88. The Stanislaus National Forest administers the South side of the Mokelumne Wilderness, if you are enterning the Wilderness from the Lake Alpine area on Highway 4. National Forest: You are in the El Dorado NF from Carson Pass, until you reach the ford of the Mokelumne River at Camp Irene. Here you depart the El Dorado NF and enter the Stanislaus NF. The Mokelumne Wilderness continues within the Stanislaus NF up to the top of Mount Reba. At the top of Mount Reba you exit the Mokelumne Wilderness. 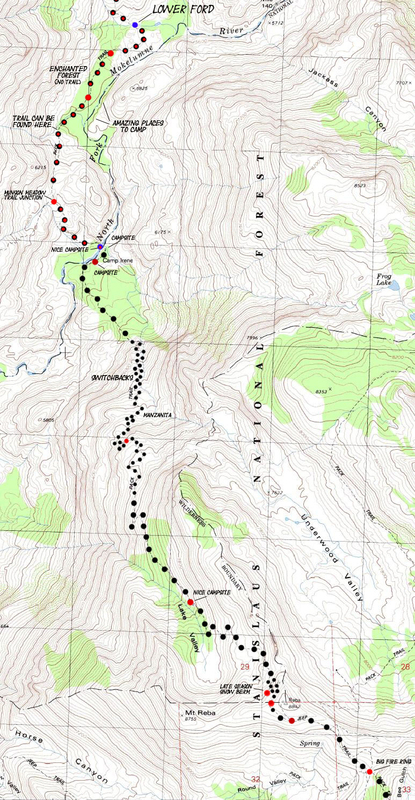 Map Section: Echo Summit to Lake Alpine on a map: Click Red Dots for trail guide pages. Map Credit: Thanks, USGS ! Move the Map to the Sierras. Select size of Maps you wish to locate. Click "Mark Point" on map to see the USGS map grid of the selected map scale.